Due to a turnout reconstruction, the tram service will be suspended in phases from Wednesday, the 10th of August 2016 (from cca. 8:00 p.m.) to Wednesday, the 17th of August 2016 (to cca. 4:30 a.m.) in one direction between Strossmayerovo náměstí and the intersection of Nábřeží Kapitána Jaroše and Letenský tunel. Line No. 8 is, in the Hradčanská – Dlouhá třída section, diverted in one direction via the stops Hradčanská (in Badeniho Street), Malostranská (at Nábřeží Edvarda Beneše) and Čechův most. Lines No. 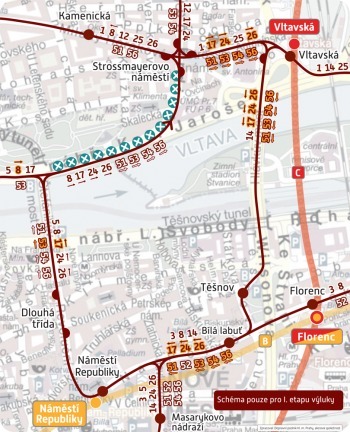 17 and 53 are, in the Strossmayerovo náměstí – Čechův most section, diverted in one direction via the stops Vltavská (at bridgehead of Hlávkův Bridge), Bílá labuť and Náměstí Republiky. Lines No. 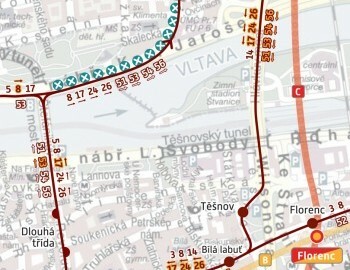 24, 26, 51, 54 and 56 are, in the Strossmayerovo náměstí – Masarykovo nádraží section, diverted in one direction via the stops Vltavská (at bridgehead of Hlávkův Bridge) and Bílá labuť. In the opposite directions, the lines are operated on their regular routes. Line No. 91 is, in the Strossmayerovo náměstí – Masarykovo nádraží section, diverted in one direction via the stops Vltavská (at bridgehead of Hlávkův Bridge) and Bílá labuť. In the opposite direction, the line is operated on its regular route. The Vltavská stop is established at bridgehead of Hlávkův Bridge (in the direction to Těšnov only). No replacement bus service is established.